Knoll boasts an extensive portfolio of products ranging from mid-century modern classics, to seating and tables, ergonomic desk chairs, outdoor classics, textiles and accessories. 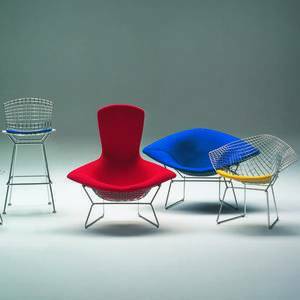 Iconic designs from classic designers such as Harry Bertoia, Eero Saarinen, Warren Platner, Isamu Noguchi and Florence Knoll make up a large component of Knoll's collection, along with innovative contemporary pieces. New Classics from Knoll: Since 1938, Knoll has been recognized for creating modern furniture that inspires, endures and evolves as new editions of classic, iconic designs refresh the Knoll collection. In honor of Harry Bertoia's 100th birthday, his Knoll Diamond Chair was introduced in 18k gold. A classic modern design that enhances any environment, the Diamond Chair remains a fascinating study in bent metal and a fixture of mid-century design. A Womb Chair fit for two. Welcome the Knoll Womb Settee into the line up. The design has been out of production, but never out of style. The double-wide design is the perfect modern refuge for the living room, bedroom or office. Designed by Edward Barber and Jay Osgerby, 2015, the Knoll Piton Stool and Table's cast-aluminum, powder coated base is a unique reinterpretation of the familiar tripod structure, with the legs visually contained by two rings. Perfect as a side table, pull-up seat or even as a full-time dining chair. Ergonomic Desk Chairs: Knoll's ergonomic chairs challenge the idea that we sit solely in one forward-facing position all day. Our portfolio of ergonomic desk chairs give the user the freedom to fidget, readjust and get comfortable. Responding to ergonomic research that challenges the idea that we only sit in a single forward-facing position, the Knoll Generation Chair is designed to support the range of postures and work styles typical of today's workplace, allowing you to sit how you want. The Knoll Generation Task Chair is available in a large range of frame options, plus back and seat colours and fabrics. 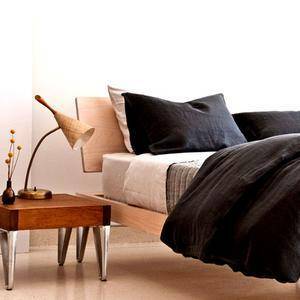 Choose what you want and need to make yourself comfortable all day. Classic Home Furnishings: Knoll produces the very best in classic home furnishings. Knoll's Collection has contemporary designs that suit your space. Designed by Ludwig Mies van der Rohe, 1929, and the perfect complement to the Barcelona Chair, the chrome and glass Knoll Barcelona Table exudes modern style and simple sophistication. Initially conceived as a rocking stool, Isamu Noguchi's 1957 Cyclone Table's playful design caught the attention of Hans Knoll who thought it a perfect complement to many of the Knoll Side and Dining Chairs. Noguchi adapted the stool into a small table in 1954, and a full size dining table in 1957. Here the Cyclone Dining Table is paired with Eero Saarinen's groundbreaking Executive Chair. Knoll is Modern Always because modern always works. Whether you are furnishing a home office or looking for comfort and style at home, each is an expression of the same search for a harmonious balance between usefulness and beauty. This entry was posted in Uncategorized, Seating & Chairs, Design & Decorating, Accents & Accessories, Living & Rec Room, Fabrics & Textiles, Kitchen & Dining, Office & Workspace, Sales and Promotions, Multi-use Chairs, Ergomonics and tagged Knoll, harry bertoia, Knoll Generation Chair, warren platner, Isamu Noguchi, eero saarinen, florence knoll, Knoll Annual sale, Knoll Diamond Chair, Knoll Womb Settee, Knoll Piton Stool, Knoll Barcelona Table, Isamu Noguchi Cyclone Table on September 16, 2016 by Christine Toller.